Granted, none of us leave this Earth alive. But talking about death is still largely a taboo subject in our culture. With the advent of life prolonging drugs and technology, life can be extended. But such extension can be gained only at a cost in terms of quality of life. 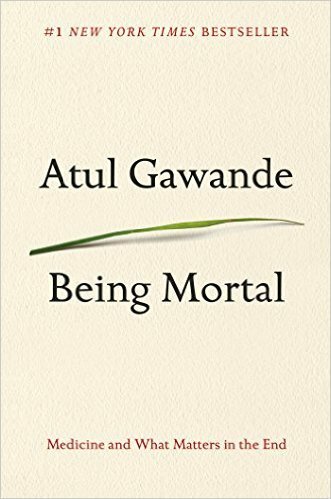 Dr. Gawande has written a thoughtful and comforting book about decision making at the late stages of life, and particularly speaks to those individuals who will likely die from terminal illnesses. He approaches the topic from the viewpoint of a medical doctor and then as a son to his dying father. While most physicians have abandoned the paternalistic approach with patients, many have turned instead to being an informant and letting the patient decide on treatment. Dr. Gawande advocates an integrated approach with the doctor and patient having a longer discussion and exploring options together. Ideally the conversation should take place earlier in the process when dealing with a terminal illness. One of the most important points is to determine what the patient views as his or her idea of a good day, given the disease status. How much function is a patient willing to give up to prolong life? I suspect that like most of you, I remain optimistic about my survival. I do not think in terms of weeks or months but rather years left to enjoy my life. While none of us can predict the date of our death, we all know that we are heading in that direction. I found Dr. Gawande’s treatment of end of life decision making easy to understand, useful and even comforting. By stating our wishes sooner rather than later, we can have more control over our last weeks. Kathleen Strosser is a “lifer” with metastatic IBC. She is the mother of two and grandmother of three. She copes with her disease by writing and finding support among her cancer sisters.